Bridal Lehenga Trends this Season! Hey there lovely bride to be’s!! Now that the Summer weddings are up I am pretty sure you guys have already done a whole lotta shopping and few things remain! I am personally shopping for the wedding of a near and dear and bring you the first hand information 😀 (of course about everything) ! So after doing a thorough market search for the right kind of bridal lehenga we finalized one! The most important thing to look for is how comfortable and glamorous do you feel about what you wear! And summers bring in a lotta fresh colors, pastels and brightness all together! Get in all your Pinks, Royal blues, Pastel Greens. And color blocking is seen in the Bridal lehengas too! Believe me or not they look fabulous! 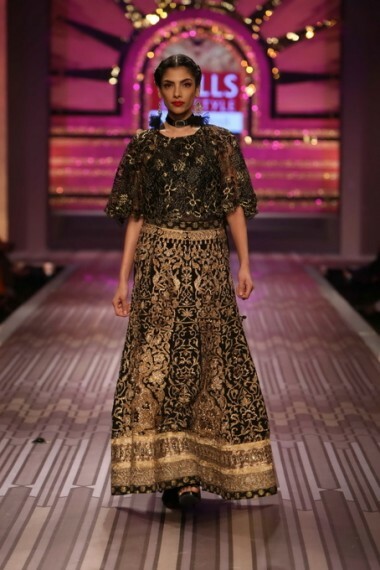 LoveLy Sabyasachi Designs! Royal Blue and Red! This Sabyasachi one Is my Favorite BTW! These days m obsessed with anything that is royal blue! P.S. they are not my designs. The respective designers own them . I just recommend them and the style! And if you love budget friendly stuff explore your nearest market and keep in mind the above colors and work that are trending now! Happy Wedding shopping lovelies..! And if you need any help in any city to fore shopping guidance we are happy to help. Just mail me at theknotstory@gmail.com and I am at your service! Presently for (Mumbai, Hyderabad, Calcutta, New Delhi) . This entry was posted in Shopping, The Knot Factory, Wedding / Marriages and tagged 2013, Bridal, bridal lehengas, Bride, clothing, indian wedding, Marriage, shopping spree, style, summer weddings, wedding, wedding lehenga. Bookmark the permalink. ← New year Party with a Difference ! I really like the wedding lahenga sing yellow is there anyway I can purchase it? I really like this royal blue and red lehnga. Could you tell me where it will be available?? I am looking in cities Amritsar, Ludhiana, Chandigarh. I will really appreciate if you could help. Thank you!!! I really like Royal blue and red lengha and also yellow red and blue can u tell me where can i find these lehngas in Chandigarh, Ludhiana and Amritsar in Punjab? Thanks for writing to us. We will get back to you shortly with the details. Hi Risham you may contact the following designer for similar lehengas or ask her if she would make you the exact same lehenga looking at the picture. Also check for dia fashions if you wish to order online. You are welcome 🙂 You can also help us with your comments about the blog and what else would you need to read about before your wedding! !